The Johnston County Visitors Bureau was recently honored with 2 awards, presented at the recent annual North Carolina Tourism Leadership Conference, held each year by the Destination Marketing Association of North Carolina. The JCVB won a Gold Destination Marketing Achievement Award in Advertising for their Girlfriends Getaway Print Advertising Campaign. 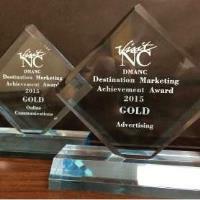 In addition, they also won a Gold Destination Marketing Achievement Award in Online Communications for the Bureau's weekly blog. Outlet shopping is by far the largest attraction for Smithfield/Johnston County with more than 7 million shopper choosing to visit, shop, spend the night, and it continues to be the driving force for economic development for the tourism industry in Smithfield. The Girlfriends Getaway advertising [DMANC Awards 2015] promotes the packaging of this attraction with others in the Smithfield area to encourage female shoppers to turn a shopping trip into an experience. Hotels that up-sale the package are averaging 10 per weekend, and others are averaging 2-3 per weekend. Room nights generated in the last 12 months estimated at approximately 748 with eight hotel partners. The Johnston County Visitors Bureau's weekly blog posts present a unique medium for announcing important tourism-related events and news, as well as serving as a platform to tell the stories of Johnston County's people and places. The top blog posts of the year included the opening of Johnston County's first legal moonshine distillery, the opening of two new chef driven and farm-fresh restaurants, the announcement that a major county event would be growing, and the story of a local girl working to make it big with her music. In total, these four top-producing posts generated 18,787 views to the blog page on our website so far. Donna Bailey-Taylor, President/CEO of the Johnston County Visitors Bureau, was also honored by the North Carolina Travel Industry Association (NCTIA) with the organization’s 2015 Public Service Award. NCTIA’ s Public Service Award is given to individuals and/or organizations for outstanding career contributions for the betterment, welfare, progress, recognition, promotion and development of the travel industry of North Carolina. Previously known as the Bill Sharpe Award, the Public Service Award is awarded annually (since 1987) in honor of Bill Sharpe, the state’s first tourism director.